Intel Graphics Technology (GT)[a] is the collective name for a series of integrated graphics processors (IGPs) produced by Intel that are manufactured on the same package or die as the central processing unit (CPU). It was first introduced in 2010 as Intel HD Graphics. Intel Iris Graphics and Intel Iris Pro Graphics are the IGP series introduced in 2013 with some models of Haswell processors as the high-performance versions of HD Graphics. Iris Pro Graphics was the first in the series to incorporate embedded DRAM. In the fourth quarter of 2013, Intel integrated graphics represented, in units, 65% of all PC graphics processor shipments. However, this percentage does not represent actual adoption as a number of these shipped units end up in systems outfitted with discrete graphics cards. 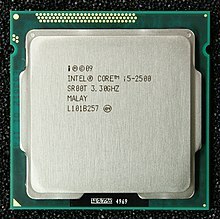 Before the introduction of Intel HD Graphics, Intel integrated graphics were built into the motherboard's northbridge, as part of the Intel's Hub Architecture. They were known as Intel Extreme Graphics and Intel GMA. As part of the Platform Controller Hub (PCH) design, the northbridge was eliminated and graphics processing was moved to the same die as the central processing unit (CPU). The previous Intel integrated graphics solution, Intel GMA, had a reputation of lacking performance and features, and therefore was not considered to be a good choice for more demanding graphics applications, such as 3D gaming. The performance increases brought by Intel's HD Graphics made the products competitive with integrated graphics adapters made by its rivals, Nvidia and ATI/AMD. Intel HD Graphics, featuring minimal power consumption that is important in laptops, was capable enough that PC manufacturers often stopped offering discrete graphics options in both low-end and high-end laptop lines, where reduced dimensions and low power consumption are important. Intel HD and Iris Graphics are divided into generations, and within each generation are divided into 'tiers' of increasing performance, denominated by the 'GTx' label. In January 2010, Clarkdale and Arrandale processors with Ironlake graphics were released, and branded as Celeron, Pentium, or Core with HD Graphics. There was only one specification: 12 execution units, up to 43.2 GFLOPS at 900 MHz. It can decode a H264 1080p video at up to 40 fps. Its direct predecessor, the GMA_X4500, featured 10 EUs at 800 MHz, but it lacked some capabilities. Sandy Bridge Celeron and Pentium have Intel HD, while Core i3 and above have either HD 2000 or HD 3000. HD Graphics 2000 and 3000 include hardware video encoding and HD postprocessing effects. Ivy Bridge Celeron and Pentium have Intel HD, while Core i3 and above have either HD 2500 or HD 4000. HD Graphics 2500 and 4000 include hardware video encoding and HD postprocessing effects. For some low-power mobile CPUs there is limited video decoding support, while none of the desktop CPUs have this limitation. The 128 MB of eDRAM in the Iris Pro GT3e is on the same package as the CPU, but in a separate die manufactured in a different process. Intel refers to this as a Level 4 cache, available to both CPU and GPU, naming it Crystalwell. Linux support for this eDRAM is expected in kernel version 3.12, by making the drm/i915 driver aware and capable of using it. Integrated Iris Pro Graphics was adopted by Apple for their late-2013 15-inch MacBook Pro laptops (with Retina Display), which for the first time in the history of the series did not have discrete graphics cards, although only for the low-end model. It was also included on the late-2013 21.5-inch iMac. In November 2013, it was announced that Broadwell-K desktop processors (aimed at enthusiasts) will also carry Iris Pro Graphics. The Skylake line of processors, launched in August 2015, retires VGA support, while supporting multi-monitor setups of up to three monitors connected via HDMI 1.4, DisplayPort 1.2 or Embedded DisplayPort (eDP) 1.3 interfaces. New Features: 10 nm Gen 10 GPU microarchitecture Mostly cancelled, Intel is now concentrating on Gen11 GPUs. Beginning with Sandy Bridge, the graphics processors include a form of digital copy protection and digital rights management (DRM) called Intel Insider, which allows decryption of protected media within the processor. Previously there was a similar technology called Protected Audio Video Path (PAVP). Intel Quick Sync Video is Intel's hardware video encoding and decoding technology, which is integrated into some of the Intel CPUs. The name "Quick Sync" refers to the use case of quickly transcoding ("syncing") a video from, for example, a DVD or Blu-ray Disc to a format appropriate to, for example, a smartphone. Quick Sync was introduced with the Gen 6 in Sandy Bridge microprocessors on 9 January 2011. Graphics Virtualization Technology was announced 1 January 2014 and is supported by Iris Pro GPUs. HD 2500 and HD 4000 GPUs in Ivy Bridge CPUs are advertised as supporting three active monitors, but many users have found that this does not work for them due to the chipsets only supporting two active monitors in many common configurations. The reason for this is that the chipsets only include two phase-locked loops (PLLs); a PLL generates a pixel clock at a certain frequency which is used to sync the timings of data being transferred between the GPU and displays. Using two or three DisplayPort connections, as they require only a single pixel clock for all connections. Passive adapters from DisplayPort to some other connector rely on the chipset being able to emit a non-DisplayPort signal through the DisplayPort connector, and thus do not count as a DisplayPort connection. Active adapters that contain additional logic to convert the DisplayPort signal to some other format count as a DisplayPort connection. By using two non-DisplayPort connections of the same connection type (for example, two HDMI connections) and the same clock frequency (like when connected to two identical monitors at the same resolution), so that a single unique pixel clock can be shared between both connections. Using the Embedded DisplayPort on a mobile CPU along with any two other outputs. ASRock Z87- and H87-based motherboards support three displays simultaneously. Asus H87-based motherboards are also advertised to support three independent monitors at once. OpenCL 2.1 and 2.2 possible with software update on OpenCL 2.0 hardware (Broadwell+) with future software updates. While Mesa does support Direct3D 9.3, this is only implemented for Gallium3D-style drivers and not for the Mesa Intel driver. Intel developed a dedicated SIP core which implements multiple video decompression and compression algorithms branded Intel Quick Sync Video. Some are implemented completely, some only partially. Intel releases programming manuals for most of Intel HD Graphics devices via its Open Source Technology Center. This allows various open source enthusiasts and hackers to contribute to driver development, and port drivers to various operating systems, without the need for reverse engineering. ^ The abbreviation "GT" appears in certain monitoring tools, such as Intel Power Gadget in reference to the graphics core on Intel processors. ^ VP9 media codec GPU accelerator to be supported post TTM, for non-Windows operating systems only. ^ Resolution details for media codec on open source Linux OS depends on platform features and drivers used. Decode/Encode features may not align to Table 8-4 that is specific to Win8.1 and Win7 operating systems. ^ All capabilities dependent on OS. Here HW support is mentioned. For more info, see Table 8-4 on page 80 of PDF. ^ a b c d e f g h "Supported APIs and Features for Intel Graphics Drivers". Intel. Retrieved 2016-05-19. ^ Michael Larabel (18 October 2013). "OpenGL 3.3 Support Lands In Mesa! Possible Mesa 11.0". Phoronix. ^ "OpenGL ES Conformant product list". ^ "Experience Visual Perfection with Intel® Graphics Technology". Intel. Retrieved 31 July 2018. ^ "Intel Iris Pro 5200 Graphics Review: Core i7-4950HQ Tested". AnandTech. Retrieved 2014-01-12. ^ "GPU market up—Intel and Nvidia graphics winners in Q4, AMD down". Jon Peddie Research. 2014-02-18. Retrieved 2014-05-14. ^ "AMD Radeon HD 7310". Notebookcheck.net. 2013-01-17. Retrieved 2014-04-20. ^ J. F. Amprimoz (2009-02-22). "The Delayed Mobile Nehalems: Clarksfield, Arrandale, and the Calpella Platform". Bright Hub. Retrieved 2014-01-15. ^ "Intel HD Graphics: A Lot Better". ^ "Intel's Official Ivy Bridge CPU Announcement Finally Live". ^ Michael Larabel (2013-09-02). "Linux 3.12 Enables Haswell's Iris eLLC Cache Support". Phoronix. Retrieved 2013-10-25. ^ "drm/i915: Use eLLC/LLC by default when available". kernel.org. 2013-07-16. Retrieved 2013-10-25. ^ "drm/i915: Use Write-Through cacheing for the display plane on Iris". kernel.org. 2013-08-22. Retrieved 2013-10-25. ^ "15-inch Retina MacBook Pro review: A tale of two laptops". Macworld. 2013-10-31. Retrieved 2014-01-12. ^ Anand Lal Shimpi (7 October 2013). "21.5-inch iMac (Late 2013) Review: Iris Pro Driving an Accurate Display". AnandTech. Retrieved 2014-01-12. ^ "Intel will announce Broadwell U 14nm cpu at CES 2014". chinese.vr-zone.com. Retrieved 2014-06-12. ^ a b Ian Cutress (2015-08-05). "Skylake's iGPU: Intel Gen9 – The Intel 6th Gen Skylake Review: Core i7-6700K and i5-6600K Tested". AnandTech. Retrieved 2015-08-06. ^ Michael Larabel (2014-09-10). "Intel Publishes Initial Skylake Linux Graphics Support". Phoronix. Retrieved 2014-09-16. ^ "Khronos Products: Conformant Products". khronos.org. 2015-07-11. Retrieved 2015-08-08. ^ Ian Cutress (2015-09-01). "Intel's Generation 9 Graphics – The Intel Skylake Mobile and Desktop Launch, with Architecture Analysis". AnandTech. Retrieved 2015-09-02. ^ Ian Cutress (2016-05-31). "Intel Announces Xeon E3-1500 v5: Iris Pro and eDRAM for Streaming Video". AnandTech. Retrieved 2016-05-31. ^ "New 7th Gen Intel Core Processor: Built for the Immersive Internet". Intel Newsroom. Retrieved 2018-08-04. ^ "The Media Engine - Intel Kaby Lake: 14nm+, Higher Clocks, New Media Engine". Tom's Hardware. 30 August 2016. Retrieved 2018-08-04. ^ Cutress, Ian. "Intel Launches 8th Generation Core CPUs, Starting with Kaby Lake Refresh for 15W Mobile". ^ "Intel® Product Specification Comparison". Web.archive.org. 7 October 2017. Retrieved 27 May 2018. ^ Shilov, Anton. "Intel Launches New Pentium Silver and Celeron Atom Processors: Gemini Lake is Here". ^ "Intel Linux Developers Begin Bringup Of Cannonlake & Cannonpoint PCH - Phoronix". www.phoronix.com. ^ "Intel Cannonlake Patches Posted For Mesa - Phoronix". www.phoronix.com. ^ "Intel Posts Initial Open-Source Graphics Driver Patches For Icelake "Gen 11" Hardware - Phoronix". www.phoronix.com. Retrieved 2018-02-11. ^ "Intel's Latest Icelake Patches Let The Display Light-Up - Phoronix". www.phoronix.com. Retrieved 2018-02-11. ^ Eassa, Ashraf. "Key Detail of Intel Corporation "Tiger Lake" Processor Revealed". The Motley Fool. Retrieved 2018-02-11. ^ Knupffer, Nick. "Intel Insider – What Is It? (IS it DRM? And yes it delivers top quality movies to your PC)". Archived from the original on 2013-06-22. Retrieved 2011-02-02. ^ Agam Shah (2011-01-06). "Intel: Sandy Bridge's Insider is not DRM". Computerworld. Retrieved 2014-03-22. ^ "Intel® Graphics Virtualization Update". ^ LG Nilsson (2012-03-12). "Most desktop Ivy Bridge systems won't support three displays". VRZone. Despite the fact that Intel has been banging its drums about support for up to three displays on the upcoming 7-series motherboards in combination with a shiny new Ivy Bridge based CPU, this isn't likely to be the case. The simple reason behind this is that very few, if any motherboards will sport a pair of DisplayPort connectors. ^ a b David Galus (February 2013). "Migration to New Display Technologies on Intel Embedded Platforms" (PDF). Intel. The Intel® 7 Series Chipset based platform allows for the support of up to three concurrent displays with independent or replicated content. However, this comes with the requirement that either one of the displays is eDP running off the CPU or two DP interfaces are being used off the PCH. When configuring the 2 DP interfaces from the PCH, one may be an eDP if using Port D. This limitation exists because the 7 Series Intel PCH contains only two display PLLs (the CPU has one display PLL also) which will control the clocking for the respective displays. All display types other than DP have an external variable clock frequency associated with the display resolution that is being used. The DP interface has an embedded clocking scheme that is semi- variable, either at 162 or 270 MHz depending on the bandwidth required. Therefore, Intel only allows sharing of a display PLL with DP related interfaces. ^ Michael Larabel (2011-10-06). "Details On Intel Ivy Bridge Triple Monitor Support". Phoronix. A limitation of this triple monitor support for Ivy Bridge is that two of the pipes need to share a PLL. Ivy Bridge has three planes, three pipes, three transcoders, and three FDI (Flexible Display Interface) interfaces for this triple monitor support, but there's only two pipe PLLs. This means that two of the three outputs need to have the same connection type and same timings. However, most people in a triple monitor environment will have at least two — if not all three — of the monitors be identical and configured the same, so this shouldn't be a terribly huge issue. ^ "Z87E-ITX". ASRock. This motherboard supports Triple Monitor. You may choose up to three display interfaces to connect monitors and use them simultaneously. ^ "H87I-PLUS". Asus. Connect up to three independent monitors at once using video outputs such as DisplayPort, Mini DisplayPort, HDMI, DVI, or VGA. Choose your outputs and set displays to either mirror mode or collage mode. ^ "Techpowerup GPU database". Techpowerup. Retrieved 2018-04-22. ^ "2nd Generation Intel® Core : Datasheet, Volume 1" (PDF). Intel.com. Retrieved 27 May 2018. ^ Michael Larabel (2014-09-20). "OpenGL 3.3 / GLSL 3.30 Lands For Intel Sandy Bridge On Mesa". Phoronix. 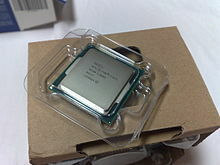 ^ "Desktop 3rd Gen Intel Core Processor Family: Datasheet, Vol. 1". Intel. Retrieved 2015-06-18. ^ "Intel Pentium Processor N3500-series, J2850, J2900, and Intel Celeron Processor N2900-series, N2800-series, J1800-series, J1900, J1750 – Datasheet" (PDF). Intel. 2014-11-01. p. 19. Retrieved 2016-02-08. ^ Francisco Jerez (14 April 2017). "mark GL_ARB_vertex_attrib_64bit and OpenGL 4.2 as supported by i965/gen7+". freedesktop.org. ^ "Release Notes Driver version: 15.33.22.64.3621" (PDF). 2014-06-02. Retrieved 2014-07-21. ^ "Intel HD Graphics (Bay Trail)". notebookcheck.net. Retrieved 2016-01-26. ^ "Desktop 4th Generation Intel® Core : Datasheet – Volume 1 of 2" (PDF). Intel.com. Retrieved 27 May 2018. ^ Michael Larabel (16 January 2017). "Mesa 17.0 Git Lands OpenGL 4.5 Support For Intel Haswell". Phoronix. ^ "Release Notes Driver version: 15.36.3.64.3907" (PDF). 2014-09-07. Retrieved 2014-09-05. ^ "Intel® Graphics Driver PV 15.40.36.4703 Release Notes" (PDF). Intel. June 23, 2017. ^ "5th Generation Intel Core Processor Family, Intel Core M Processor Family, Mobile Intel Pentium Processor Family, and Mobile Intel Celeron Processor Family Datasheet – Volume 1 of 2" (PDF). Intel. 2015-06-01. p. 22. Retrieved 2016-02-11. ^ "Intel Iris Pro Graphics 6200". notebookcheck.net. Retrieved 2016-02-09. ^ "Intel Iris Graphics 6100". notebookcheck.net. Retrieved 2016-02-09. ^ "Intel HD Graphics 6000". notebookcheck.net. Retrieved 2016-02-09. ^ "Intel HD Graphics 5600". notebookcheck.net. Retrieved 2016-02-09. ^ "Intel HD Graphics 5500". notebookcheck.net. Retrieved 2016-02-09. ^ "Intel HD Graphics 5300". notebookcheck.net. Retrieved 2016-02-09. ^ "Intel HD Graphics (Broadwell)". notebookcheck.net. Retrieved 2016-02-09. ^ Adam Cetnerowski (22 March 2018). ""Enable OpenCL 2.1 in Broadwell"". Github. ^ "Intel HD Graphics (Braswell)". notebookcheck.net. Retrieved 2016-01-26. ^ "DRIVER VERSION: 26.20.100.6709" (PDF). Downloadmirror.intel.com. Retrieved April 18, 2019. ^ Michael Larabel (20 January 2017). "Beignet 1.3 Released With OpenCL 2.0 Support". Phoronix. ^ Michael Larabel (16 February 2018). "Intel Open-Sources LLVM Graphics Compiler, Compute Runtime With OpenCL 2.1+". Phoronix. ^ Brandon Fliflet (21 December 2017). "Initial Commit". Github. ^ Michael Larabel (27 October 2015). "Intel Is Already Publishing Open-Source "Kabylake" Graphics Driver Patches". Phoronix. ^ "OpenCL - The open standard for parallel programming of heterogeneous systems". 21 July 2013. ^ "Intel® Core™ i5-600, i3-500 Desktop Processor Series, Intel® Pentium® Desktop Processor 6000 Series" (PDF) (PDF). Intel. January 2011. Retrieved 11 May 2017. ^ a b c Robert_U (19 January 2015). "Intel® Iris™ and HD Graphics Driver update posted for Haswell and Broadwell version 15.36.14.4080". Intel Communities. Intel. Retrieved 16 April 2016. ^ "5th Generation Intel® Core™ Processor Family Datasheet Vol. 1" (PDF) (PDF). Intel. 1 June 2015. Retrieved 16 April 2016. ^ "Desktop 5th Gen Intel® Core™ Processor Family Datasheet, Vol. 1" (PDF) (PDF). Intel. 27 May 2015. Retrieved 16 April 2016. ^ "6th Generation Intel Processor Datasheet" (PDF). Intel. October 2015. Retrieved 12 February 2016. ^ "Datasheet, Vol. 1: 7th Gen Intel® Core™ Processor U/Y-Platforms" (PDF). Intel. August 2016. Retrieved 26 September 2016. ^ "8th Gen (S-platform) Intel® Processor Family Datasheet Vol.1". Intel. Retrieved 2017-10-21. ^ "N-series Intel Pentium Processors and Intel Celeron Processors Datasheet – Volume 1 of 3" (PDF). Intel. 2015-04-01. pp. 77–79. Retrieved 2016-02-08. ^ "Intel® Pentium® and Celeron® Processor N- and J- Series" (PDF). Intel. Retrieved 2017-06-03. ^ "2017Q2 Intel Graphics Stack Recipe". 01.org. 2017-07-06. Retrieved 2017-08-14. ^ a b "Intel Atom Processor Z3600 and Z3700 Series Datasheet" (PDF). Intel. December 2014. Retrieved 12 February 2016. ^ "Intel Atom Z8000 Processor Series Datasheet (Volume 1 of 2)" (PDF). Intel. 2016-03-01. p. 130. Retrieved 2016-04-24. ^ "Linux Graphics, Documentation". Intel Open Source Technology Center. 01.org. 2014-01-12. Retrieved 2014-01-12.